Professor Layton has ruined me for adventure games. I know that Layton’s games aren’t quite classic adventure games, but the differences are why I love Layton and why I am indifferent to most of the genre. In most adventure games, the developers have to go to extreme lengths to incorporate the puzzles into the game world. The games are intricately designed to give the player the tools needed to solve their problems and to make sure that each of those tools has a believable reason to be there. In the end, I find that it generally hamstrings both the puzzles and the stories the puzzles are propping up. The story is forced into situations that allow the player to solve puzzles and the puzzles are forced to fit into the general milieu. No puzzles involving ray guns, because ray guns don’t make sense. The story needs you to go in this storage closet because you have to have a screwdriver later. It may only be a problem to me, but the delicate blending of story and puzzle usually leaves both unsatisfying. The Professor Layton series gets around this problem by flatly ignoring it. You solve puzzles because that is what the game is about. Brainteasers and the like. The story of is there because it is the most entertaining method of delivering those puzzles. The good Professor’s cases are always charming, at least somewhat due to his world’s fascination with puzzles. 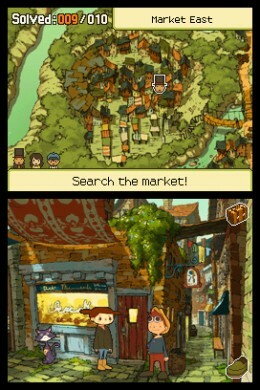 Instead of building the puzzles into the story, though the fourth game has done this a couple of times by the halfway point, Layton merely has characters offer them to the player as challenges. Sure, this crazy old bat has the information you need, but she’ll only give it to you if you solve her puzzle. What the puzzle is doesn’t matter at all to the story. The stories in Layton games are always charming pieces of fluff. They occasionally hit a strong, moving character moment, but rarely is there anything exceptional. But the puzzles are invariably better than those I’ve encountered in actual adventure games. Solving a Layton puzzle is so satisfying. The game presented you with a challenge and you overcame it. In regular adventure games, when I finally stumble upon the solution, my reaction is usually vague anger. It is either so ridiculously circuitous a solution that I hate the game for thinking it up or stupidly easy, but frustratingly obtuse. Either way it is no fun. I’ve played enough Layton games now that I know I can never go back to the old games. I’m sure I’ll try them out occasionally, because I can never leave well enough alone. I’m sure adventure game purists will scoff at my missing the point for hating adventure games for what makes them great. The only thing I’m not sure of is my continued access to future Layton games. I can only hope that unlike every other game I like, Professor Layton has been financially successful here in the states and they keep being made. But that is just me being grouchy and pessimistic. 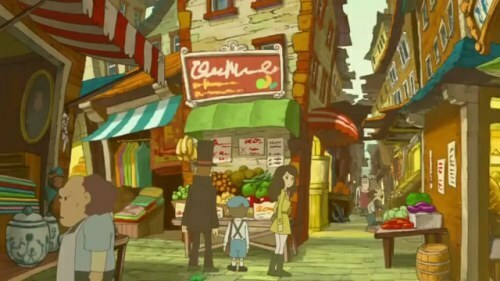 At least the Layton movie is being released here next month. I’ll have to buy that.